I tried figuring this out on my own, and it wasn't giving me any options. Basically, on some of my forms, I have it to where they can select "cash, check, credit card". I am trying to do it, to where if they select "credit card" and fill out the rest, and hit submit, it will submit that form to me, and then redirect them to another page automatically to enter in their credit card information. Or, is it possible to when they choose credit card, some fields appear asking them to enter in the information? I have tried it both ways, and cant get it to work. I think that's possible with JotForm, you can use Conditional Logic on Forms for that. Here's an explanation. 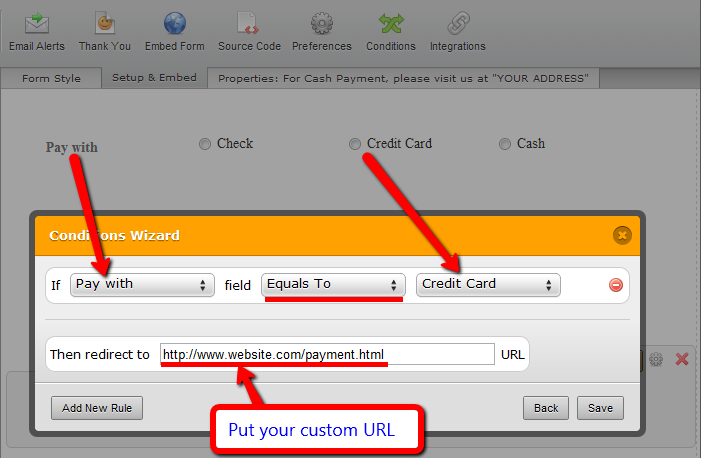 You can also do the same for the other payment options. See it in action with this form http://form.jotform.me/form/21617535700448?, you'll be redirected to Paypal when you choose Credit Card. I have also added some extra descriptions when a certain payment type is selected, this possible with HIDE/SHOW conditions (the first option in the condition wizard). Hope this helps. Let me know if everything isn't clear to you. Thank you so much!